“Hit them, don’t tap them.” Waffen SS motto Initially formed as Hitler’s bodyguard, the Waffen SS built on the martial doctrine of the German Army to become the vanguard of Germany’s war effort. SS formations were used as mobile “fire brigades” on the Eastern Front, plugging dangerous gaps in the thinly defended lines against the Red Army. In all theatres it was the highly motivated and well equipped Waffen SS that spearheaded attacks, earning them a reputation for stubbornness, courage and savagery. 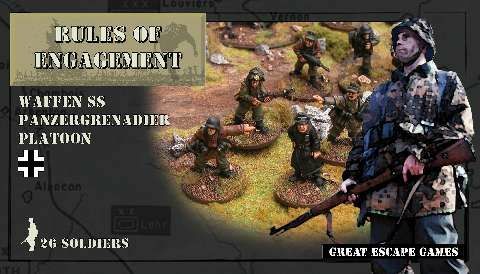 This box contains 26 detailed Artizan Designs miniatures, enabling you to field a platoon command and two infantry squads, the basic structure of a Waffen SS Panzergrenadier platoon in Rules of Engagement. These 28mm metal miniatures include 8 riflemen, four light machine gun teams of two men each, 4 NCO’s, and 6 command figures. Contents may vary.